Haptic feedback that feels like the real thing. Haptics is the science and technology of touch. For decades, haptic feedback has been synonymous with vibrating motors. Vibrations are useful for smartphone notifications, but you’d never mistake a buzz for touching a real object. That’s why our team at HaptX takes a fundamentally different approach to haptics. Our patented¹ microfluidic technology lets you feel the shape, movement, texture, and weight of virtual objects—taking haptic feedback to a new level. 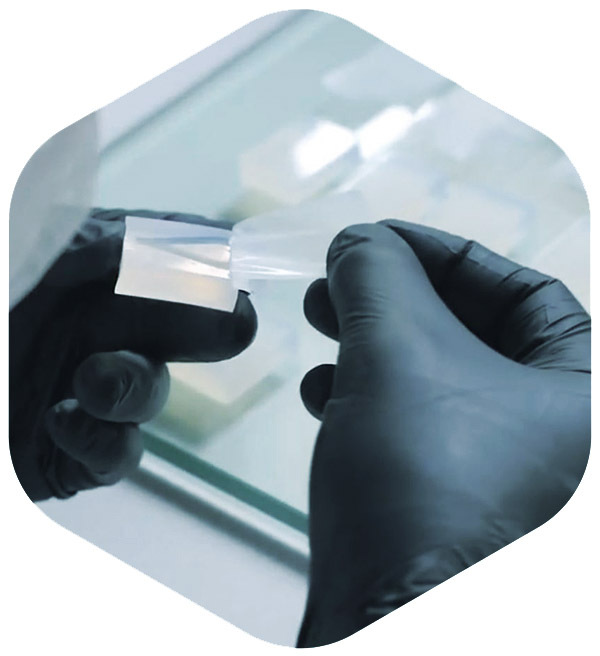 Our microfluidic skin is a flexible, silicone-based smart textile containing an array of high-displacement pneumatic actuators and microfluidic air channels. Microfluidic skin panels are embedded throughout HaptX Gloves to provide realistic touch sensations across the hand. Each glove contains 130 microfluidic actuators that provide haptic feedback by pushing against the user’s skin, displacing it the same way a real object would when touched. At only 1.5mm thick, microfluidic skin delivers an unprecedented combination of high actuator density, displacement, and bandwidth, setting a new benchmark for haptic feedback performance. Our lightweight force-feedback exoskeleton is powered by the same microfluidic actuation technology as our skin. HaptX’s high-power-density, microfluidic actuators enable the ultra-lightweight hand exoskeleton in our HaptX Gloves to apply up to four pounds of force to each finger. These resistive forces complement the haptic feedback produced by the microfluidic skin, enhancing the perception of size, shape, and weight of virtual objects. Realistic haptic feedback requires extremely precise motion tracking. Our software must know exactly where a user’s body is positioned in space to render convincing haptic interactions. Hands are particularly challenging because of their dexterity and small size. 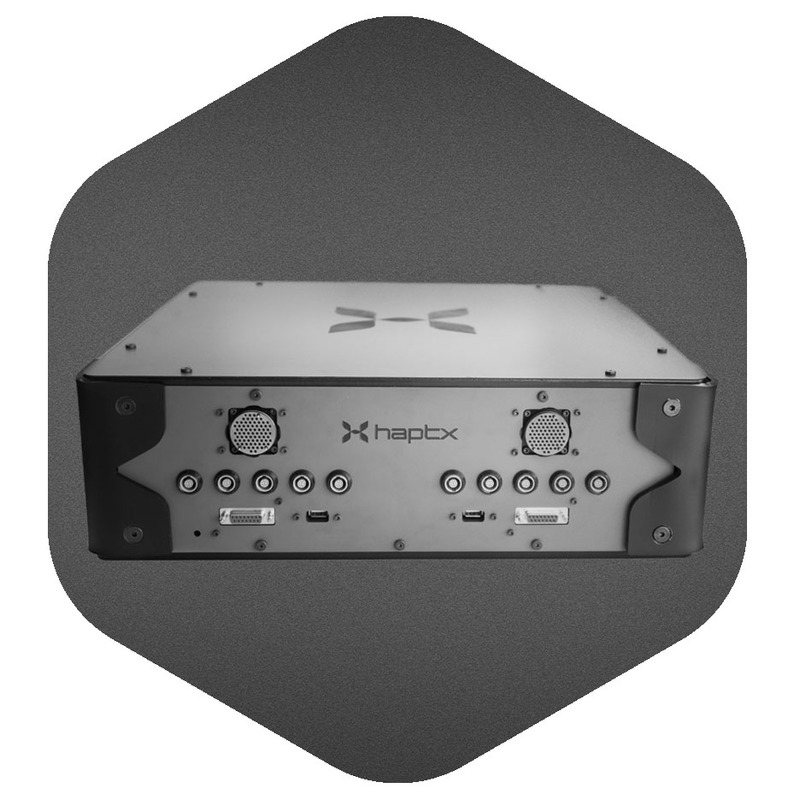 HaptX’s magnetic motion tracking and hand simulation system leverages proprietary software and electronics to deliver sub-millimeter accuracy hand tracking with six degrees of freedom per finger and no occlusion. Our software automatically generates an individualized, physically-accurate hand model. No coding required. HaptX is pioneering a new generation of precision pneumatic components. Our compact control console features a proprietary, high-density valve array with an unprecedented level of performance and efficiency. A mini-compressor supplies air to the console. Featuring near-silent operation, this compressor is designed for use in offices and other noise-sensitive environments. The HaptX Software Development Kit (SDK) empowers developers to create touch-enabled experiences. At the heart of the HaptX SDK is a framework for physical simulation of haptic interactions. The HaptX SDK works seamlessly with leading game engines, including Unreal Engine and Unity, making it easy for developers to create VR experiences that leverage the advanced haptic capabilities of the HaptX platform. HaptX’s multidisciplinary team includes mechanical, software, electrical, and biomedical engineers. The engineering team is applying novel tools and methodologies to pioneer a new approach to haptics and crack the toughest problems in human-machine interaction. From lower-body exoskeletons that let you move through a limitless VR environment, to thermal feedback systems that let you feel the fire of a dragon’s breath, our team is pushing the boundaries of what’s possible with haptic technology. Our mission is to bring lifelike touch to digital experiences, and we won’t stop until you can’t tell what’s real from what’s virtual.